Isamu Noguchi produced this abstract piece following his return from confinement at the Japanese-American internment camp in Poston, Arizona (from May through November 1942). It seems that he's attempting to use "pure abstraction" to express some very real, powerful emotions and perhaps to purge some of the harsh memories of his time there. Although Noguchi initially volunteered to join other Nisei (American born Japanese Americans) at the camp in an effort to improve their living conditions, help set up programs for cultural awareness & development, and develop plans for community's future expansion and development. He pursued these objectives at the urging of some U.S. government officials. Ultimately, he realized the government had no intention in investing in the community or improving their living conditions. Instead he saw it for what it was: a concentration camp surrounded by high fences, barbed wire, security towers, and machine guns. Once Noguchi put in a request to leave the camp, he then realized that even he was being confined against his will. It took many months for him to secure a temporary pass to leave the camp. On leaving the camp, he headed directly for New York, essentially having escaped imprisonment by the U.S. government. Although Noguchi had done some explicitly social and political art in the past (such as the sculptural mural in a market in Mexico and his piece Death (Lynched Figure), he turned away from realism toward abstraction. At the same time, he turned from making works with explicit social or political content. On his arrival in New York, he secured a secluded studio in Greenwich Village and set to work on new sculptural work. My Arizona is one of the early examples of his new commitment to abstraction and formal investigations. 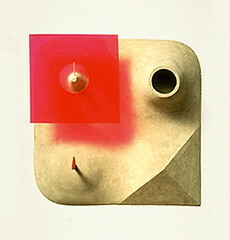 Although the components of this four-square design seem on the surface "pure forms", they also appear to suggest strong emotive significance for Noguchi. One way to read this work is by examining and comparing it with a seemingly abandoned piece that may have been a predecessor for the base of this wall-hung work. Both pieces are visible in a photograph of Noguchi's studio by Andre Kertesz from the mid 1940s. The apparently earlier version has a similar overall structure (four square organization, but somewhat different details. Comparing the details and forms of each may be instructive toward understanding Noguchi's ideas for this work. The addition of red plexiglas elements (one that is a square with a central circular opening and the other an element (perhaps symbolizing a heart?) at the apex of a hemispherical mound. A cone with an open top and a four-sided pyramid occupy the other two squares. The two square corners and two rounded corners suggest a locus with a multiplicity of formal pressures. I read this compression of ideas and forms as an encapsulation of the confined landscape of the Poston internment camp as well as a symbolic representation of Noguchi's own experience in the form of a "psychological landscape". I'll explore these themes further in additional posts. Archival photograph by Michio Noguchi.